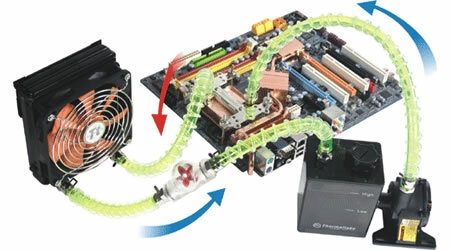 It may be silent, effective, and cool to show off, but that Liquid Cooling System (LCS) you have in your computer needs to be maintained. Just like a car’s oil, or coolant, the liquid in your LCS gets used and abused every day. Over time the liquid breaks down and needs to be replaced. I know some of you may be thinking “It’s a closed system. Nothing gets in or out of it. Why would it need to be changed?” Well, that’s what we are here to show you. The liquid in a LCS may not be exposed to external debris, but it is exposed to many things each day, even if you don’t use the system. The metal on your CPU heat sink may not appear to corrode, but it will slightly. The change from hot to cold, mixed with the elements of the fluid are a deadly combination for just about everything in your system. The liquid in liquid coolant is not just water. It’s a mixture of several things including Propylene Glycol, Ethylene Diamine Tetra Acetate Detetrasodiura, Methy Paraben, and of course Water. Ethylene Diamine Tetra Acetate Detetrasodiura is actually a chemical that is used to remove all traces of magnesium and calcium ions from the solution because it binds tightly to them, in order to control unwanted side reactions with these metals during the cooling and heating process. This would be what they use to stop the corrosion of the heatsinks, and is fairly effective. Methy Paraben, commonly called Methylparaben is a preservative. an anti-fungal agent often used in a variety of cosmetics and personal care products as well as a food preservative. This is the ingredient that keeps the mold and mildew out of the lines. As you can see, there are plenty of additives that attempt to maintain the cleanliness of the warm, dark, wet environment. The inside of the LCS is basically a cesspool waiting for mold, mildew, and filth to come to it.